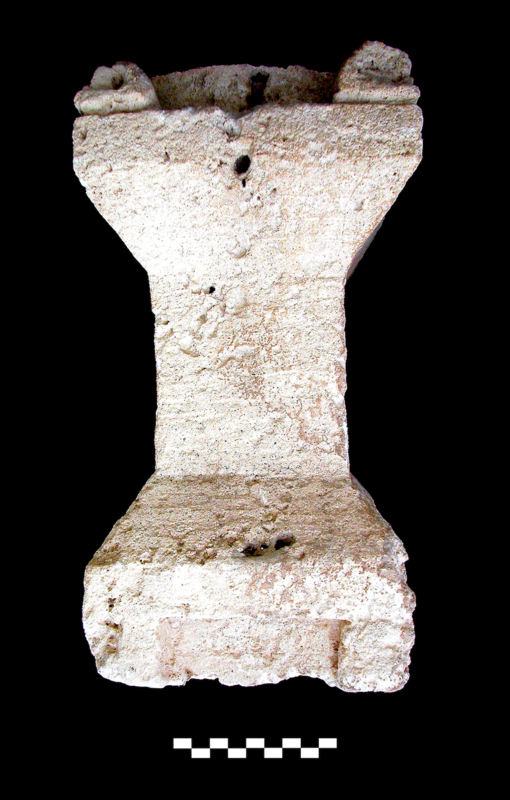 Medium fine-slightly coarse, yellowish, soft limestone (oolitic) with many vacua and prominent surficial gouges. Coarse, sandy mortar with numerous large pebble inclusions applied to the top surface thickly (<0.0061 m max Th) and extending as a blob over one edge (<0.0260 m max Th). 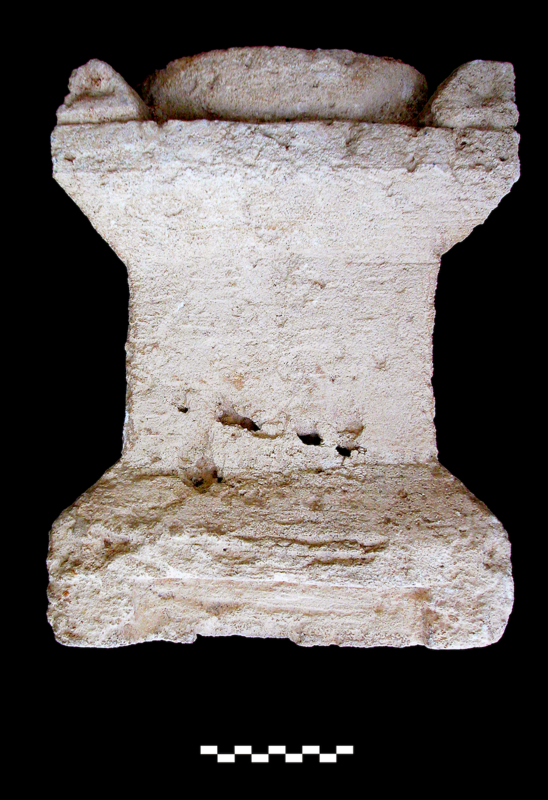 Portable stone altar with rectangular form and simple decorative features on base and crown. Top is flat surface almost completely covered by a raised, circular portion (H. 0.036 m) that is slightly concave, like a patera (?). Corners of upper surface bear simple acroteria (H. 0.037-0.039 m) with sloping backs that are bilobate and bifacial, with depressions in both faces. Below top is a vertical face (H. 0.030 m), and below that is an inward sloping face (H. 0.0351 m). Central portion of altar is a plain, rectangular pedestal. This rests on an inverted, outward sloping face like a pyramidal segment (H. 0.0524 m). This articulates with rectangular base that has recessed panels in middle of all sides creating appearance of blocky legs at corners. No painted or inscribed decoration visible on surface. The generously applied mortar on the top is hard to interpret unless something was affixed to the upper portion. The application of mortar might postdate primary use of altar. Overall the form is rather heavy and chunky with fine lines; nonetheless, the composition is balanced and symmetrical. No evidence for stoneworking is visible, though surface is somewhat granular and abraded, which may obscure chiselmarks. Intact but lower edges are battered and somewhat broken; tip of one acroterion has been broken off. Slight, extensive erosion and pitting on all surfaces.